As military families, many of us dream of our forever home that we'll buy some day, or perhaps we simply want to invest in property at our latest duty station. When our slice of the American dream seems within reach, there's much to consider as home buying dreams collide with the reality of financial considerations. Do you know the credit score you’ll need to qualify for a home loan? If your credit score is less than ideal, do you know how to begin the process of repairing it? What about planning for your down payment, home maintenance, and other homeowning expenses that will crop up? How about finding a mortgage lender and the different types of home loans? In the latest ebook offering from MilitaryByOwner, we're highlighting help for homebuyers! This first in a series of three ebooks geared toward home buyers focuses on questions like the above and more. With checklists to help you understand your credit score breakdown, common home loan types, expenses you'll face, and how to repair your credit, this free ebook is packed with information for future home buyers. Don't walk through this process alone! 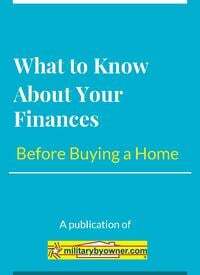 Download What to Know About Your Finances Before Buying a Home and then check out all the other free information MilitaryByOwner offers for home selling, buying, and more!